Hey ladies, what’s up these days? How have you been doing? So, let us think about one fabric that never ever seems to go out of fashion. I guess, most of you would agree that Denim never goes out of vogue and are here to stay. Not only Jeans but a denim jacket and even a denim dress makes me grow weak in my knees!! However, do not always wear it in the same style and try pairing it up in different ways to look your stylish best, always!! Read about the top 5 looks we have compiled for you to wear your denim dresses smartly and if you do not own one already why don’t you go online shopping, right now! Got to hang out with friends and want to wear something casual, stylish and totally comfortable? A denim dress with no sleeves. Choose something that is a little fitted at the bust line to define your figure. Pair it up with a smart animal print clutch. A cool pair of sunglasses and heels in a metallic hue such as Copper, Golden or Bronze shall help you complete the look. If you are going to be out under the sun, do not forget to add a straw woven hat!! When the weather turns somewhat cool, try layering up your Denim dresses! A Long length shrug in a cool shade of Grey or Coffee when combined with Black tights, gumboots in the same shade as your cardigan or shrug looks stunning.Add a streak of smartness by adding a watch with a fabulous dial. Denim goes really well with striped patterns.Wear a full-sleeves Tee shirt. If you wear your denim dress with a striped tee shirt, the sleeves would look really smart and chic. Add a clutch and sleek bellies in shades that compliment your dress and you are good to go! You could also include a metallic necklace for a cool fashion-forward vibe to complete your outfit. You can make a plain, old Denim dress really fun to wear by adding some feminine elements such as a pastel shaded blazer or floral print blazer. Add a delicate bracelet and earrings for a soft, sensual appearance. Low platform heel could be your to go for this look, in case you decide to wear this look to your office. Somehow the color of Basic Blue denim looks simply great with Camel shade and you can take advantage of this fact by creating a westernized look by wearing a Camel shaded Belt, a sling bag, watch, ankle length shoes and sunglasses in similar shades.This look has a rustic-cow boyish element yet happens to be distinctly modern. Last but not the least, pair up with some amazing accessories like a smartwatch, cool sunshades, and stylish footwear and you are good to go. Stock up some stuff as famous online shopping sites are offering handsome discounts right now!So, these were Tips to wear your denim dresses smartly.Do you have any more fun ways to wear a Denim dress? I love denim dresses and i am sure everyone love .. Very nice compilation .. I LOVE ANYTHING IN DEMIN. YOU HAVE SHARED SOME AWESOME TIPS. Oh, I love Denims so much, they are evergreen classy piece. Layering it up is the one which I’m in love with right now! Great ideas! Thanks Babe 🙂 I’m glad this post could be of some help to you. 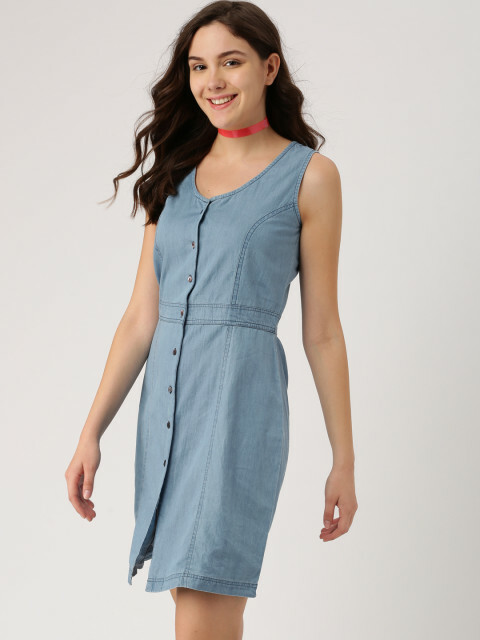 Denim dresses are always in trend and I could see some cool ideas to style it. I have just started wearing dresses, so a denim dress with all these options of styling sounds really good! thanks for sharing. Denims are like the LBD, always fashionable and dependable. They can never go wrong. Getting creating around them is interesting! Well said. Denims are the new LBD’s these days. I really love to wear denim. and this style will never be lost in the trend. Every style has it’s own significance. I personally love to layer it up. It’s very fancy. these are some wonderful tips, i have been always skeptic abt how to wear denim and if at all it will look good on me. I’m sure you will flaunt soon in a denim dress too 🙂 Just wear what makes you feel comfortable 🙂 and you will surely rock the look. Some great styling tips. Love the idea of wearing it with a blazer, will surely give it a shot. Amazing and beautiful post. Very useful and beneficial tips for denim styling. Great thought. I usually don’t prefer Denim dresses since I feel it won’t suits me. But your post gives me the confidence to try at least once.